On This Shelf you will find Homeopathic remedies for everyday aches and pains like Headaches, Dizziness, Painful joints, Neuralgia, Joint pains and hot flushes. 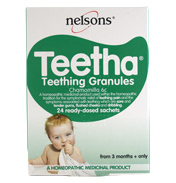 Nelson also offer support for Babies during teething with their Teetha product. Nelsons is a leader in natural medicines and have been around for over 145 years. All over the world they are a known brand. Their aim is to bring the high quality products to more and more people worldwide.